DiversifyUs was created in mid-November during a St. Louis Startup Weekend, a weekend-long event designed to help aspiring entrepreneurs turn their ideas into potentially viable businesses. The idea came to McFarland as the St. Louis area was experiencing its fourth month of unrest in the wake of the August 9th shooting death of teenager Michael Brown in the St. Louis suburb of Ferguson. We had seven questions for McFarland, as we approached the one month anniversary of the endeavor…. INNOVOX STL: So, how’s it been these last four weeks? MCFARLAND: I didn’t anticipate how much the idea would resonate with people, so I’m glad, and I feel honored to have had it. However, now that we’ve gotten some attention, and in light of some negative attention our city has gotten recently, I feel a certain responsibility to make good on the win. I want to do that for my team and others who believe in what we’re trying to do and also for the opportunity to help St. Louis be known not for things like racial unrest and disaffection, but for creating understanding and pulling people together. INNOVOX STL: You’ve been quoted as saying the idea came from a discussion with your wife. Can you explain? MCFARLAND: My wife and I were on our date night and we were sitting in the car talking about some discussions she’d had with the planning committee for (community organization) Mercy Quarterly, for whom she volunteers. Their next event was going to be in regard to issues surrounding things that were happening in Ferguson. At the same time, I was preparing for Startup Weekend — starting the very next night — and I was trying to come up with an idea I might pitch. While she was talking, the back of my mind was spinning away. My wife and I met online eight years ago using Match.com, and as we talked about rising tensions in Ferguson, it struck me that while there are myriad ways for people to meet people with whom lots of key factors are shared, there weren’t many ways for people of differing groups to meet and interact. I believe that tensions stay high between differing groups in large part due to the general distrust that grows between people who don’t know each other. Often, we tend to assume the worst about people we don’t know, especially when they belong to an entirely different social circle than we do. In that moment, I had the idea that we need an app that helps people from these different groups to find their similarities and then connect and converse. I called it DiversifyMe. INNOVOX STL: Pitching your idea at Startup Weekend can be a bit of a frenzy. You basically get one minute to state your case. Was the word “Ferguson” in your pitch and if so, do you think that sealed the deal? Mc Farland: I wasn’t going to pitch the idea because Startup Weekend requires marketable concepts. I initially thought DiversifyMe was really a non-profit concept. Later, at Startup Weekend, I shared the idea with the guys I was with and they loved it and insisted that I pitch it. In the pitch I did mention that I was having a conversation about Ferguson when the idea hit me. I think that got people’s attention but I don’t think it “sealed the deal” per se. I think people resonated with the notion that people from differing groups need to meet and that knowing each other will help us stop hating each other — or at least, it will help. INNOVOX STL: When people hear the term “diversity” it seems they immediately think of race. Will the app go beyond race? What about Republicans who want to talk to Democrats, millennials who want to talk to baby boomers, Southerners who want to talk to Northerners, liberals who want to talk to conservatives? Will that be part of the mix? McFarland: It’s definitely not just about racial groups. In these modern times, stratification is the norm. Everyone has their own silo. From race to age to politics to religion to sexual orientation and myriad other things, everyone belongs to their own little minority group. These groups might be useful for marketing purposes, but they are destructive to society. I believe that as we isolate ourselves in these groups more and more, we grow distrustful of people in other groups in the same category. So DiversifyUs seeks to help people in all types of groups find ways to relate to one another so that they can realize that while they are different, they aren’t entirely different. INNOVOX STL: So how do you plan to monetize? McFarland: We plan to sell use of the DiversifyUs app to businesses that already spend large amounts of money on diversity and inclusion programs. 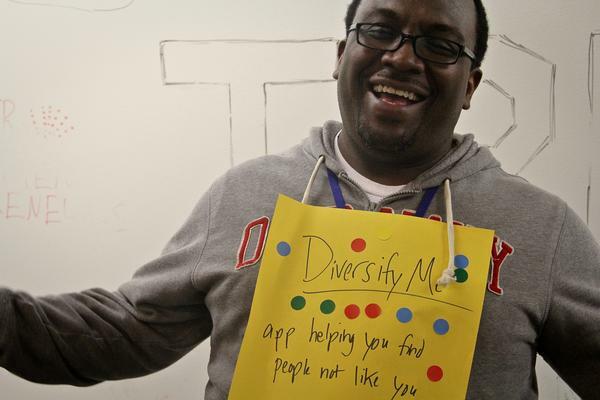 We’ll sell another version of the app to colleges and universities — we call that DiversifyU. A third version of the app is targeted for the general public and we call that DiversifyMe, but we won’t start on that version until we’ve made more headway with the others. INNOVOX STL: If you look at social media in particular, you see a lot of flame throwing these days. What’s out there that makes you think people are ready for DiversifyUs? McFarland: First of all, the only people who will use DiversifyUs are people who want to connect with someone in a different social group. So, for example, if there are black-white racial tensions in Ferguson, our app connects those people if both actually want to connect. If instead you want to isolate yourself and be a member of the group that you’re already in, then you’ll never be a DiversifyUs user. But DiversifyUs is a mechanism that enables people to hear outside perspectives and gain insight. Businesses that value diversity benefit by being able to reach broader groups of people with their product or service and by drawing from a broader pool of worker candidates. In addition, diverse and inclusive workforces experience higher retention rates. INNOVOX STL: Obviously you want DiversifyUs to be successful. What will success look like to you? McFarland: I was born in North St Louis at Homer G. Phillips hospital and I grew up in a culture that was quite unlike what I’ve come to know working in corporate settings for the last 20 years. And while I had plenty of help from my parents and family, teachers and from organizations like INROADS, it took effort and determination to learn how to relate successfully to people who came from much different backgrounds than I did. Not everyone will have the outside assistance that I had, but I think that DiversifyUs can help people feel less detached and unheard and more included. The degree to which I can do that I think I will be successful. Of course, we intend to be a profitable company. So having our first actual paying customer would feel like a success too.